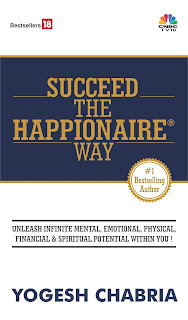 Yogesh Chabria - The Happionaire ​Blog - Best Motivational Speakers In India - Inspiration, Success: The More You Give – The More You Get! The More You Give – The More You Get! I know this might sound strange in today’s world and a few of you might even refuse to believe it. However this is something I personally believe in very strongly and always try to follow. I believe that the more we give, the more we get. It is something I have experienced over time and it is truly one of the most amazing things anyone can experience. The simple act of giving in each and every sphere of life can bring in a lot of benefits. This applies to almost everything - right from investing, to business to relationships. I feel that every time we give we become channels through which whatever we are giving is shared even further. In fact some of the biggest and most successful businesses are a result of the desire to share and give. Some of them had a new idea to share or some had a new service in mind. While still others wanted to give us new technology. Of course in the process the entrepreneur did end up making profits and creating wealth, however that is simply a result of the desire to give and share. As I said the more you give, the more you get. I also fully support the view that entrepreneurs and businesses should be rewarded for what they do. I find it strange when people try to victimise and blame entrepreneurs for being commercially rewarded. What one Ratan Tata can do for a nation is much more than what several NGOs can do. Even managements can learn a lot from this simple concept. For instance a business which is eco-friendly and gives better service and quality gets much more than one which isn’t and offers poor service and quality. In any relationship too, the more love you give the more you get in return. With your parents, wife, husband, children, grand parents…try giving more and see the change it brings about. Another thing I have realized is that whenever we give we shouldn’t expect to get anything in return. That will make sure we aren’t dissatisfied. Many times for instance we help people and then several years later we in some way or the other are helped back by them. Or even if we aren’t helped by them directly, we are just creating a more positive environment for each other. It creates a society where we all try to lend a helping hand and rise together. So many times we are nice or helpful to someone in school and than almost several decades later they end up helping us in some way or the other. It has happened to me. The more we try to be of help to people around us whenever we can, the more positive energy is generated within us and around us. These are things I have experienced and feel. I try to incorporate these ideas into my life whenever I can. What do you feel? Do you agree or disagree? Do You Jump and Buy Stocks? Here is a message from Aniket Waghmare for those who subscribed to his service. I completely agree with you Sir. I too remember how I helped a friend in school and then later in life he went onto help me with my work in a big way. The more friends you have the better you grow. Completely agree. Giving begets more pleasure and satisfaction than any other act. Giving takes many forms, be it ideas, opportunities, guidance, knowledge, a soulful performance or simply your very best in whatever you do. Satisfaction from the giving will only come if the giving is without any expectation in return. If there is any expectation attached, resultant dissatisfaction cannot be ruled out. Give like a Tree! Very nicely put Yogesh as well as Gopinath. This is something which works very well in business and networking. BTW Gopi your blog is great...very funny! Great to see so many talented people here. This is abosultely true. I have personally also experienced such things. Very True, See India gave and assured to give more, and in return got a lot! India is now a part of elite nuclear club, accepted as a nuclear power state. Organisation called NSG was esablished in reaction to India's first Nuclear test in 1974, and today same body gave India recognition, which they were not ment for. Process is ongoing. Now India has to be more responsible, focused and be ready to avail as much as possible for the devolopment of the country. i couldnt agree more to yogesh about giving more without any expectations, just we as human still tend to expect more than we give so be strong fellow happionaires and never expect anything from anybody because when you start expecting and not get u might feel low about it.